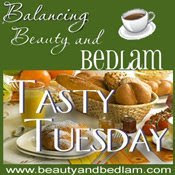 It's Tasty Tuesday over at Balancing Beauty and Bedlam. Please visit Jen today to find more delicious meal ideas! I plan on posting about my sister's bridal shower several times this week, and I figured that this is the perfect opportunity to share my recipe for Incredible Pink Punch. It's fabulous! Don't go crazy now...this is a virgin punch! I've served it at birthday parties and it's always a hit. In a large plastic container, combine the cranberry-raspberry juice with the pina colada mix. (Note: I am never able to find bottles of cranberry-raspberry juice in 46 oz. I buy the 64 oz. size and just mix it to taste) It makes a cool psychedelic swirl effect when you mix it! Freeze overnight. In fact, I'd make it the afternoon before to be sure it freezes all the way! Remove mix from freezer 30 minutes prior to serving. Place frozen slush in punch bowl and slowly add raspberry ginger ale. I think the cranberry gives it a little kick, but it's still sweet. I've had many compliments on this one. It works well for birthday parties, showers, or other get togethers. Stay tuned this week for more fun, and be sure to click over here to find out more about my Decorating Dilemmas Party! There is a giveaway contest for participants! Sounds awesome. I've never heard of cranberry ginger ale, but now I'll go searching for it. I can't wait to try this punch! This sounds delicous! It would be perfect for a party or shower. I'll be saving this recipe to try. Thanks for sharing!! Great idea for the bridal open house I am hosting in September. Thanks so much for sharing. I hope you will join me at diningwithdebbie.blogspot.com for Crock Pot Wednesdays. The giveaways this weeks are really great! The recipe sounds yummy! Are you excited for tomorrow's finale of So You Think You Can Dance? Who are you rooting for? The punch was sooo good. Thanks for the recipe. And happy belated anniversary!! Oh my goodness, this looks divine and makes me all of a sudden need a Sonic. :) Love your idea about the Design Dilemna~ I featured one on my blog today. I know a ton of people have them, and may not have the money for a consultation, so it should be popular!